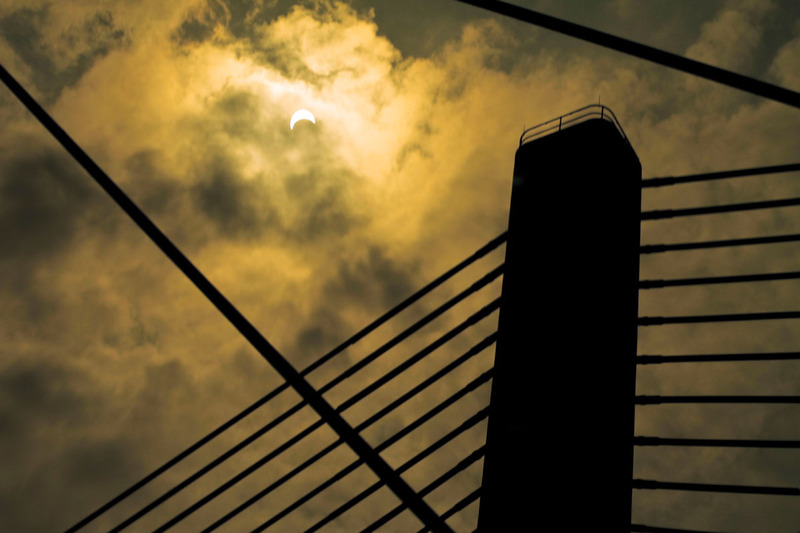 As crowds gathered around the nation to watch a solar eclipse on Monday, Aug. 21, the Indian River Inlet Bridge offered a picturesque backdrop. 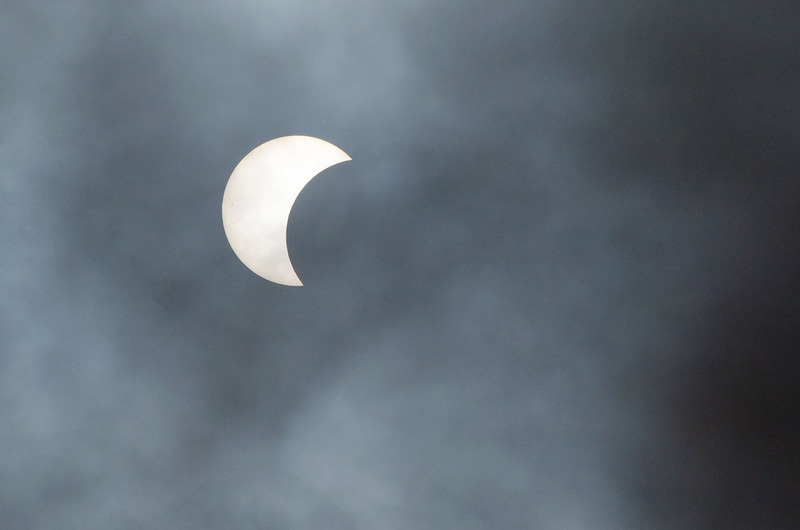 The solar eclipse as seen through a thin layer of clouds from the boardwalk in Bethany Beach. The Thompson family takes a photo with their eclipse glasses on while viewing the eclipse at the boardwalk in Bethany Beach. 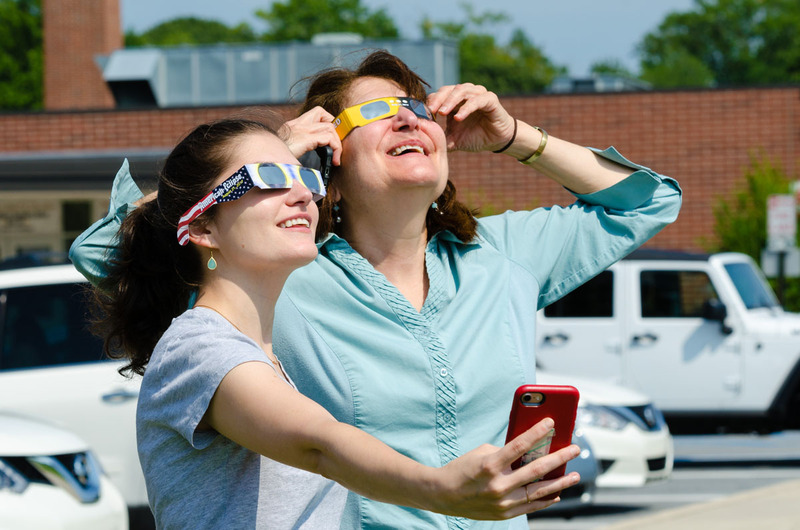 Maria and Diane Counts take a selfie while viewing the solar eclipse at Lord Baltimore Elementary School. This coming Monday, everyone will be given the opportunity to experience a unique and rare happening — a total solar eclipse. A solar eclipse occurs when the moon passes directly between the sun and the Earth, casting a shadow onto Earth. According to Astronomy magazine, the last time Delaware experienced totality was July 29, 1478. This year, those in Delaware will experience 80 percent totality, which is expected to begin around 1:20 p.m., with peak viewing time at 2:46 p.m.
Those who wish to view the scientific phenomenon may do so a few different ways. The Selbyville Public Library will host an event from 1:30 to 3:30 p.m., during which community members may drop in for crafts, solar eclipse viewing and educational movies. Snacks and beverages will be provided. The Frankford Public Library will hold a solar eclipse viewing party from 2:30 to 3:30 p.m., during which community members can learn about the celestial event. A limited number of “eclipse glasses” will be provided. The library suggests those who attend bring a lawn chair or blanket to the grassy lot next to the library. Visitors are also being invited to view the solar eclipse from the Indian River Inlet Bridge on Monday. Park staff will be at the South Inlet Day Area pavilion from 1 to 4 p.m. The program is free; however, parking is not — regular park entrance fees are in effect. Attendees may purchase their viewing glasses there for $2. Those who wish to surf-fish during the event may do so at Delaware Seashore State Park, at 3R’s drive-on beach, hosted the Big Chill Beach Club. 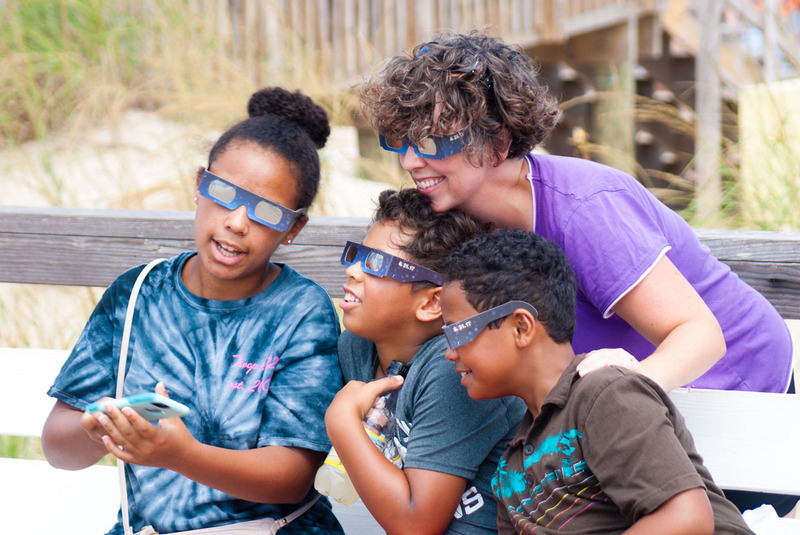 Or, for those who are willing to drive a bit out of state, NASA’s Wallops Flight Facility’s Visitor Center is hosting an eclipse viewing party from noon to 4:30 p.m. There, observers will be able to experience 81.5 percent of the eclipse. Free eclipse glasses for safe viewing will be provided, and they will stream the NASA-TV live broadcast from 1 to 4 p.m. The event also will feature solar-themed movies and activities as well as food and beverages for purchase. For those who wish to stay home or can only sneak out of work for a few minutes to view the solar eclipse, there are a few safety items to keep in mind. Do not view the solar eclipse without proper eye protection. All eclipse glasses or viewers should be compliant with the ISO 12312-2 international safety standard. Do not look at the partially eclipsed sun through a camera, binoculars or sunglasses. Looking directly at the partial eclipse without proper safety eyewear can cause serious, permanent damage to one’s eyes. For those who lack a safe viewing method, a pinhole projector (an optical projector one can create at home) will allow them to view the partial eclipse without looking at the sun. The next total solar eclipse to be experienced in the United States will be on April 8, 2024. For more information on the solar eclipse, visit eclipse2017.nasa.gov. For more information on pinhole projectors, visit eclipse.aas.org/eye-safety/projection.